In the previous section on Soma Rudra or Gluon field, we saw how Chiral Symmetry breaking leads to hadronization with goldstone bosons as pions, moves the Universe from a pion condensate to the one having massive hadrons. We saw Chiral Symmetry breaking is Kaksivat Rishi, the pions (or) goldstone bosons are the ‘Ga’ or ‘Cows’, Soma Rudra is the gluon field which liberates from Varuna (pion condensate) pAsa, consumes all the asuryam (quark-antiquark pairs) as ‘spokes’ inside the wheel leading to formation of bounded beings (hadrons). Thus Soma Rudra or gluon field becomes the soil on which the Universe evolves. We also saw ekapAda are those elementary bosons that are their own antiparticle, dvipAda are those that have distinct particle and anti-particles, catuspAda are those that are four component force fields that existed in the early Universe (dyu-loka) that did not have mass. Dyuloka is the early Universe in which particles did not have mass. The Universe was before electro-weak symmetry breaking occured is the dyu-loka. In that loka particles were massless. We also saw Soma, the gluon field is the cause of all reflected luminosity as gluon field reflects photons and hence called Chandra. We now travel back from Chiral symmetry breaking to times of Electroweak symmetry breaking. Vaivasvata Manu refers roughly to a ‘radiation’ epoch of Universe. Vaivasvata means Radiation. Manvantra is the epoch. In the Standard Model, Universe was in Vaivasvata Manu or Radiation dominated phase, post the Inflation epoch and before the Electro-weak symmetry breaking. In this epoch the Universe was filled with massless particles. Each manvantara lead by a Manu is an ‘epoch’ of the Universe through which Universe transitions. More on this later.. This story of Hayagriva or Matsya or mAdhava is set in the Vaivasvata Manvantra. There was once a Hayagriva demon who stole the vedas from Brahma, due to which Brahma could not progress with creation and evolution of Universe. The Matsya Purana talks of HayagrIva demon being slayed by Matsya, the one-Horned fish. Bhagavata purana talks of Madhu-Kaitabha demon who stole the vedas and Maha-vishnu slays the Madhu-Kaitabha in the form of HayagrIva. Devi Bhagavatam talks of Hayagriva demon who could only be slayed by Hayagriva demon. MahaVishnu assumes a Hayagriva form and slays the demon. In my understanding Madhu-Kaitabha and Hayagriva demons are same. Similarly the Matsya and HayagrIva forms of Vishnu as well as the ‘mAdhava’ form of Vishnu are different understandings of the same form of Vishnu. This could be seen if we understand the cosmic event behind it. Thus Hayagriva by bringing back the evolution becomes the 'Deva' of Knowledge. Once Vishnu was sleeping or was overcome by Yoga Nidra. Yoga Nidra is maha mAyA or Shakti. At that time, from his ears madhu-kaitabha demons rolled out. This madhu-kaitabha demons stole the vedas from Brahma and stopped all creation in the Universe. No creation or evolution progressed in the Universe. Madhu-Kaitabha could not be defeated by anyone as they roamed the Universe freely. Vishnu had to be woken up to stop Madhu-kaitabha. Hiranyagarbha or Brahma prayed to Shakti or the Yoga Nidra to leave Maha-Vishnu. Yoga Nidra leaves mahaVishnu and vishnu wakes up. But when Vishnu wakes up, since Vishnu was sleeping slanting on a bow, the bow string got torn and in that process cut off Vishnu’s head. Devas find a horse head for Vishnu and fix it to Vishnu. Now Vishnu becomes Hayagriva. This Hayagriva now fights the demon Hayagriva (madhu-Kaitabha) and breaks the demon Hayagriva. The demon HayagrIva or madhu-Kaitabha when defeated manifests 12 parts of 2*6 parts of what becomes the soil for the entire Universe. Shiva is Energy. Shakti is Momentum. Vishnu is Mass provided by Higgs. All particles are massless at the origin except Higgs. How particles acquired mass through electroweak symmetry breaking is the story of HayagriVa vs Hayagriva or madhu-Kaitabha vs HayagrIva or Matsya vs HayagrIva. In the Inflation epoch, Universal spacetime (Hiranyagarbha) had expanded. The potential energy that got released as Hiranyagarbha or spacetime was born became a soup of massless particles or Energy (Shiva). This time of the Universe or the epoch of the Universe is called a Radiation dominated phase of the Universe. Puranas refer to this epoch as Vaivasvata (Radiation) manvantara (epoch). In this Universe, Higgs field manifests everywhere in space, in vacuum, but in a different ‘phase’ than other fields of standard model. This Higgs field is Maha-Vishnu. The Higgs field or Maha-Vishnu is said to have four parts (catur Atma). The four parts are called H+, H-, H0 and h. These Higgs components were massive. Catur Atma means the four part extremely virtual. This original four component Higgs field that existed before Higgs condensation are the Catur Atma. Because the Higgs field or Maha-Vishnu can interact with nearly all particles, as particles travel through the Higgs field, it affects them in a dramatic way: It can impede their motion, if it condenses. This impeding motion is seen as ‘mass’. Thus mass depends on if the Higgs field condenses or not and the amount of interaction (coupling) the particle has with the Higgs field. At the origins of the Universe, just after the inflation epoch, at very high temperatures, the Higgs field does not ‘condense’. Hence it does not impede the motion of particles and they move at the speed of light like fish in an unfrozen lake effortlessly. Thus at this point of time all particles are massless. This was the time Madhu-Kaitabha (Electro-weak force) is said to have came out of the ‘ears’ of the Higgs field (Maha-Vishnu). In other words the Madhu-Kaitabha (Electro-weak force) and Higgs field (Maha-Vishnu form) are related into an Unified force field at some point of time. The Madhu-Kaitabha or Hayagriva demon or Electro-weak force was a part of (or related to) Maha-Vishnu or Higgs field in some way. Madhu are the electro-weak boson particles W1, W2, W3. Kaitabha is Hypercharge X (or B) particle. 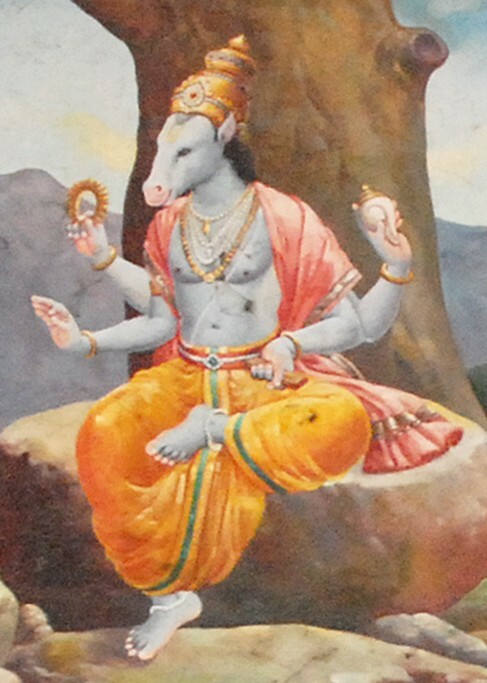 Madhu is said to be Horse-necked or Hayagriva as they manifest together as Electro-weak field. The ‘Horse’ head is the ‘Hyper-charge’. ‘Asva’, Asvin (Horses) are all associated with ‘charges’ or fields associated with charges. Since Madhu is attached to a horse-head Kaitabha, Madhu is called Hayagriva or horse-necked. This Madhu-Kaitabha or HayagrIva is able to move freely in the Universe as the four component Higgs field is not condensed at very high energies of the Universe and hence it does not impede the movement of Madhu-Kaitabha. The Vedas or knowledge of evolution is lost. The Universal spacetime (Hiranyagarbha or Brahma) on whom the evolution takes place, cannot evolve as all particles are massless. The Madhu (W1 W2 W3) bosons and Khaitabha (X or B) rule over the Universe. Brahma has lost the knowledge (Vedas) to evolve further. Veda is the Knowledge or Know-how of evolution. When particles are massless, the know-how of evolution is lost. The spacetime Hiranyagarbha is filled with massless particles. The four component Higgs, the Maha-Vishnu manifests as another Hayagriva to break this Hayagriva of Madhu-Kaitabha. How does it happen..? As Madhu-Kaitabha or HayagrIva ruled over the Universal spacetime, Puranas say that Brahma (the Gravity) prayed to Yoga-Nidra, the Maha-mAyA or Shakti the Momentum to leave Maha-Vishu, so as to ‘wake up sleeping Vishnu’ or ‘give mass to particles’. Standard Model predicts that as the Momentum (Shakti or mAyA) comes down or reduces, that is temperature comes down, the Higgs field condenses. As Shakti, mAya or momentum goes out (or reduces) and Higgs field condenses, the property of mass (Vishnu) wakes up. This higgs condensation is akin to vishnu (property of mass or Higgs boson) waking up from the sleep, as particles start acquiring the property of mass, as they get impeded. When this Higgs field condensation or Vishnu waking up from sleep happens, four component Maha-Vishnu loses his head. That is the Higgs Boson, h, is separated out of the four component higgs field (H+, H-, H0, h). The Higgs Boson is the Vasudeva, the deva which resides in all beings. The Higgs boson resides in all quarks and leptons through Yukawa coupling. It separates out totally from the rest of the three components of the Higgs field. The three-components higgs (H+,H-, H0) invades HayagrIva or Madhu-Kaitabha. This invasion or breaking up of the Madhu-Kaitabha or HayagrIva demon by Maha-Vishnu and the separation of head of Vishnu (Higgs Boson) is called Electro-weak symmetry breaking through Higgs mechanism. The W1 W2 W3 bosons are pierced, invaded by the Higgs field (H+, H-, H0) providing them with huge mass which limits their interaction distances and make them ‘weak’. So new W+, W- and Z bosons are born in this invasion of Higgs on electro-weak bosons. It becomes massive due to the invasion of the Higgs as Higgs strongly couples with electro-weak bosons due to condensation. It so strongly couples with it, it is said to invade the weak force bosons and make them very weak. This force now becomes limited in distance and it causes decay over a long period, giving more life time to particles compared to strong or electromagnetic forces. Thus the new HayagrIva has bosons (W+, W-, Z) that mediate the ‘weak’ force. The W+, W- and Z bosons are the new ‘mAdhava”, the one who originated from ‘madhu’(W1, W2, W3). The demon madhu was powerful and decayed all the particles over long distances. This new mAdhava that is massive is ‘weak’, reduces decay of particles and gives them longer life. For example, a neutral pion (which decays electromagnetically) has a life of about 10−16 seconds, while a charged pion (which decays through the weak interaction or mAdhava) lives about 10−8 seconds, a hundred million times longer. The new mAdhava is a Hayagriva or horse-necked as the ‘Horse-head’ (Asva) of hyper charge now separates out, becomes photon (Asva) that mediates the electromagnetic charge. The Photons that mediate the electromagnetic force do not couple with the Higgs field at all. Hence they are said to get ‘separated’. Thus with this Higgs invasion into madhu-kaitabha the electro-weak bosons, electromagnetic and weak force get separated. This new Hayagriva or the ‘massive’ Madhava thus is a form of Maha-Vishnu. Thus Maha-Vishnu (Higgs field H+, H-, H0, h) is called the ‘Madhava’ the massive Weak-force bosons (W+, W- Z) as well as ‘Madhusudhana’ the slayer of the demon Madhu (W1, W2, W3 bosons). When Madhu and Kaitabaha are slayed (W1, W2, W3 and B) and new mAdhava, the weak force bosons (W+, W- Z) form and become massive due to invasion of Higgs. This new form of Vishnu is also a HayagrIva or horse-necked as the Photon horse head separates. The Higgs boson, h, or the Vasudeva starts ‘residing’ in quarks and leptons. It resides in the sense it couples lightly with quarks and leptons compared to the invasion and breaking of Weak force bosons (which is a stronger coupling). Because of the light coupling vasudeva also impedes quarks and leptons, rather lightly, but starts giving mass to these particles. Thus the quarks and leptons which were massless, now acquire masses by coupling with Higgs boson (h) or the vasudeva as they are impeded by the Higgs boson or they are said to acquire mass. But quarks and leptons get divided into 12 parts or 12 flavors (2 * 6) based on how well they couple with Higgs field. The Higgs Boson or Vasudeva is said t reside in them in 12 different ways or flavors. Six flavors of quark appear as vasudeva resides in six different ways. Six flavors of leptons appear as vasudeva resides in them also in six different ways. Thus the quarks and leptons are said to be broken into 12 pieces or flavors (2*6). These 12 pieces of quarks and leptons form all the land or soil or earth of this Universe. Since the quarks and leptons get their flavor from Electro-weak symmetry breaking as Higgs Boson separated, they are called ‘Medini’. Medini means enriched with ‘mass’ or ‘fat’. Of the 6 flavors of Quarks, the Top-Quark has the highest mass as it couples with Higgs Boson mostly. This Top Quark is the Adi-Sesha on which the Vasu-deva or Higgs Boson is said to reside mostly or more strongly. Standard model describes the above process of Hayagriva defeating Hayagriva or vishnu defeating madhu-kaitabha as electro-weak symmetry breaking caused by Higgs field acquiring a Vacuum expectation value lead to separation of Electromagnetic force, weak force and Higgs Boson (which gives mass to quarks and leptons through Yukawa coupling). Bhagavata Purana also talks of Matysa the great ‘Fish’ with human head and body of fish which manifests during a great deluge or flood. When Brahma yawns at night, the demon Hayagriva steals the vedas from Brahma’s mouth. The Universe cannot further procreate or evolve as Brahma loses of the knowledge of evolution. Satyavrta or Vaivasvata Manu, a king of ‘Dravida’ country saves a fish which in turn talks of a flood that will envelope the Universe. The fish which grows ever advises king satyavrta to make a large ship and save himself and the sapta rishis. The fish volunteers to ‘couple’ with boat and tow the boat to safety during the floods. The King does the same by coupling the boat to horn of the fish and reaches land. The fish fights the demon Hayagriva and rescues the Vedas. The evolution of Universe proceeds again once Matsya Fish has slayed the demon Hyagriva. The real Matsya in this story is the four component Higgs field (H+, H-, H0, h). The ‘h’ which is the Higgs Boson is the Vasudeva the head of Higgs field, pictured as human head. The other three H+, H-, H0 are the body of the fish. Another way to picturise this foru component Higgs field is the Higgs Boson component (h), the vasudeva as a ‘Horn’ jutting out of the body of the fish (H+, H-, H0). Thus the Higgs field is an ‘Eka-Shringa’ or ‘One-Horned’. Post the Inflation epoch Universe was filled with massless particles of all types. It was deluged or flooded. The evolution could not proceed as Hiranyagarbha the spacetime has lost the evolutionary knowledge with all particles being massless. The ‘Matsya’ or fish that existed at that time was the Higgs field with Vasudeva as its Horn. This Higgs field was a huge Matsya or fish that existed all across the flood. In the flood were the Hayagriva the W1, W2, W3 bosons with horse-headed Hypercharge X. This matysa or four component higgs field fought with Hayagriva or Weak bosons as in the story described here, slayed the demon, gave mass to weak bosons limiting their interaction distances and weak, separates the weak and electromagnetic field. The ‘Horn’ of the fish, the Higgs Boson, the vasudeva, couples with quarks and electrons, gives them mass and ensures they are safely towed across the flood of massless particles. Once it is done, the Universal evolution started again or Brahma got back the Vedas. Maha Vishnu is the four component Higgs with H+, H-, H0 and h. This Higgs couples with particles in four ways. Pradyumna means that existed before in the dyu-loka. In Dyu-loka the Higgs field did not condense and hence did not couple with particles at all. Pradyumna is where the higgs field does not couple with particles or does only self-coupling. Aniruddha means unstoppable. Where the higgs field entering the particle cannot be stopped and couples strongly, the particles possess huge mass. W and Z bosons, first generation quarks like Top Quarks and Taons couple in this way with Higgs. Samkarshana means oscillating or moving to and fro. Where the higgs field enters the particle but moves out, the mass of the particle oscillates. Nuetrinos couple with Higgs in this way. Vasudeva mean one which resides or even floats (on a particle). Where the higgs field resides lightly or couples lightly with particles resulting in light mass, it is caused by vasudeva. The third generation quarks and leptons couple with Higgs in this way. Catur Vyuha means the the four ways in which something is divided. vyUh means dividing, vyUha means divisions. Catur Vyuha means four divisions. The four divisions that exist post the Higgs condensation are the Vasudeva (light coupling of Higgs boson), Samkarshana (oscillatory coupling of Z bosons), Aniruddha (strong coupling of W+, W- bosons) and Pradyumna (no coupling or self-coupling). Catur damshtrah means the four toothed. The four divisioned Higgs bites into particles in four different ways. Hence it is said to have four tooth. Catur bhujah means the four sided, the one that exists in four dimensions of spacetime. The stanza in Vishnu Sahasranama ‘Catur Atma Catur Vyuha Catur damshtra Catur bhujah’ means “The four soul (that assumes) four divisions (that bites with) four teeth (on) four sides. The Higgs field becomes divided into four and bites the particle on four sides. Vishnu Sahasra nAma also says “Catur Murti Catur bahuh Catur Vyuhah Catur gatih”. Catur Murti means four physical forms. The four physical forms are the massive Weak bosons, Higgs boson, Quarks and leptons. Catur bAhuh means four armed. The above four physical forms become the four arms. Catur gatii means four velocity. The bosonic fields indeed exhibit four velocity, four momentum in four dimensional spacetime.